It is safe to say that it has been a challenging 30 days as we tried to promote the Kickstarter funding drive to try to get this book published. We sincerely appreciate all those that stepped up and pledged their support. If you saw the last project update there, or looked at any of the new material here on the site, you know we aren’t giving up on this project. If you were a pledged backer there and are willing to convert that pledge to an incentive purchase, please visit our Funding Incentives page and do so. It’s less clicks and hassle than the Amazon process from Kickstarter! You already pledged the money. Please follow through and get it to us! As we move forward, we’ll be managing our own funding drive for this project. No more Kickstarter for Underwater Sombrero. When we started with Kickstarter, we new that we would have to promote the project ourselves as much as possible, both to our contacts and to our contacts’ contacts. We also had an expectation that we would receive some support from Kickstarter in the form of project exposure. That didn’t happen. 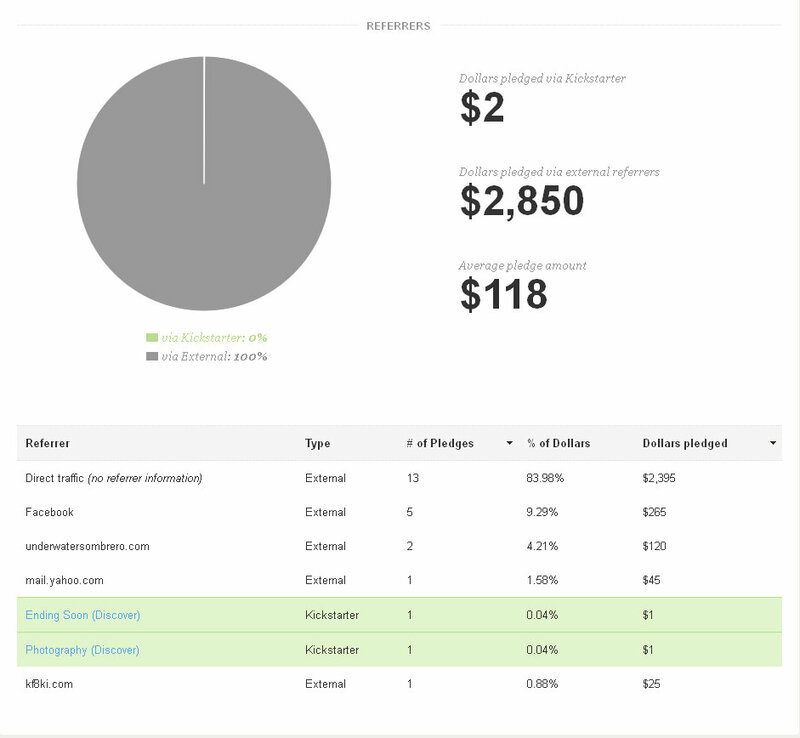 Kickstarter keeps some 5% of project funds if a project is funded. For our $8000 Kickstarter goal, that would have amounted to $400. Our project would have paid $400 for nothing more than 30 days of web hosting. That’s it. Even the payments are processed by someone else at an additional expense to the project. You can see the statistics yourself. Below is the final pledge statistics graph provided by Kickstarter. Only in the last 10 hours or so of the project did we get any attention from the Kickstarter website at all, and then it was as a result of the automatic “ending soon” feature which prompted two $1 dollar contributions from site members, likely wishing to simply up their “projects backed” stats without having to spend any money. So, after 30 days of hosting on a site with “Featured Projects”, “Staff Picks”, “Project of the Day” and a blog that discusses notable projects, not to mention Facebook and Twitter promoting projects, we got no attention from Kickstarter at all until the last 10 hours, and then only because their automated “ending soon” function picked us up, and then it was too late. We wonder how the outcome might have been if we had been publicized even just once by Kickstarter. Apparently we’ll never know. So, Kickstarter for us turned out to be nothing more than web hosting for our project. Had we managed to get funded through our efforts, it would have been expensive funding at that. $400 for 30 days. We don’t need to spend that kind of money for hosting, so we don’t need Kickstarter! We also don’t need their help to manage online payments and we can offer incentives just like those offered on Kickstarter. As is probably obvious by now, we won’t be using Kickstarter again. If you were a Kickstarter backer, please visit our Funding Incentives page and select your incentive and follow through with the purchase. You already committed the money and it would have been collected today. We’re just asking that you please go ahead and get it to us!